With a perfect blend of contemporary and casual, this dining set will bring a breath of fresh air to any dining space. 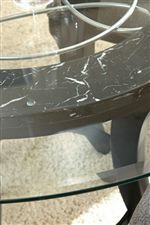 Splayed legs are found throughout and a faux marble insert is visible through the glass table top. A gorgeous tempered glass top completes the look and creates a fun environment to relax or entertain. The Cayman 5 Piece Glass Top Dining Set by Steve Silver at Walker's Furniture in the Spokane, Kennewick, Tri-Cities, Wenatchee, Coeur D’Alene, Yakima, Walla Walla, Umatilla, Moses Lake area. Product availability may vary. Contact us for the most current availability on this product. The Cayman collection is a perfect blend of contemporary and casual. The ornate features of this collection will bring a breath of fresh air to any dining space. Splayed legs and unique ornate metal designs are found throughout and a faux marble inset is visible through the gorgeous glass table top. Combining elegance and fun this collection creates an environment fit for both relaxing and entertaining. The Cayman collection is a great option if you are looking for Transitional furniture in the Spokane, Kennewick, Tri-Cities, Wenatchee, Coeur D’Alene, Yakima, Walla Walla, Umatilla, Moses Lake area. 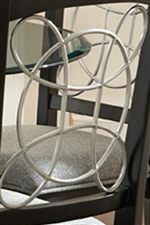 Browse other items in the Cayman collection from Walker's Furniture in the Spokane, Kennewick, Tri-Cities, Wenatchee, Coeur D’Alene, Yakima, Walla Walla, Umatilla, Moses Lake area.